Iron dagger and scabbard mount. 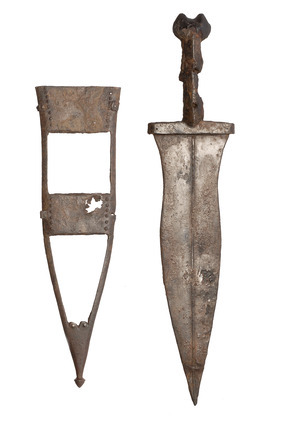 The dagger has a broad, flat, leaf-shaped blade with a double edge and slight mid-rib. Its iron-plated grip and heart-shaped pommel are in two halves and rivetted to the central tang. Bits of the scabbard's leather remain on the mount.